BackgroundMutations in the gene encoding the RNA-binding protein fused in sarcoma (FUS) can cause familial and sporadic amyotrophic lateral sclerosis (ALS) and rarely frontotemproal dementia (FTD). FUS accumulates in neuronal cytoplasmic inclusions (NCIs) in ALS patients with FUS mutations. FUS is also a major pathologic marker for a group of less common forms of frontotemporal lobar degeneration (FTLD), which includes atypical FTLD with ubiquitinated inclusions (aFTLD-U), neuronal intermediate filament inclusion disease (NIFID) and basophilic inclusion body disease (BIBD). These diseases are now called FUS proteinopathies, because they share this disease marker. It is unknown how FUS mutations cause disease and the role of FUS in FTD-FUS cases, which do not have FUS mutations. 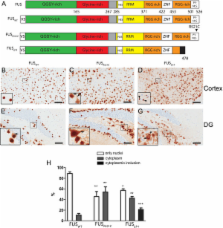 In this paper we report the development of somatic brain transgenic (SBT) mice using recombinant adeno-associated virus (rAAV) to investigate how FUS mutations lead to neurodegeneration.ResultsWe compared SBT mice expressing wild-type human FUS (FUSWT), and two ALS-linked mutations: FUSR521C and FUSΔ14, which lacks the nuclear localization signal. Both FUS mutants accumulated in the cytoplasm relative to FUSWT. The degree of this shift correlated with the severity of the FUS mutation as reflected by disease onset in humans. Mice expressing the most aggressive mutation, FUSΔ14, recapitulated many aspects of FUS proteinopathies, including insoluble FUS, basophilic and eosiniphilic NCIs, and other pathologic markers, including ubiquitin, p62/SQSTM1, α-internexin, and the poly-adenylate(A)-binding protein 1 (PABP-1). However, TDP-43 did not localize to inclusions.ConclusionsOur data supports the hypothesis that ALS or FTD-linked FUS mutations cause neurodegeneration by increasing cyotplasmic FUS. Accumulation of FUS in the cytoplasm may retain RNA targets and recruit additional RNA-binding proteins, such as PABP-1, into stress-granule like aggregates that coalesce into permanent inclusions that could negatively affect RNA metabolism. Identification of mutations in other genes that cause ALS/FTD, such as C9ORF72, sentaxin, and angiogenin, lends support to the idea that defective RNA metabolism is a critical pathogenic pathway. The SBT FUS mice described here will provide a valuable platform for dissecting the pathogenic mechanism of FUS mutations, define the relationship between FTD and ALS-FUS, and help identify therapeutic targets that are desperately needed for these devastating neurodegenerative disorders. Several families have been reported with autosomal-dominant frontotemporal dementia (FTD) and amyotrophic lateral sclerosis (ALS), genetically linked to chromosome 9p21. Here, we report an expansion of a noncoding GGGGCC hexanucleotide repeat in the gene C9ORF72 that is strongly associated with disease in a large FTD/ALS kindred, previously reported to be conclusively linked to chromosome 9p. This same repeat expansion was identified in the majority of our families with a combined FTD/ALS phenotype and TDP-43-based pathology. Analysis of extended clinical series found the C9ORF72 repeat expansion to be the most common genetic abnormality in both familial FTD (11.7%) and familial ALS (23.5%). The repeat expansion leads to the loss of one alternatively spliced C9ORF72 transcript and to formation of nuclear RNA foci, suggesting multiple disease mechanisms. Our findings indicate that repeat expansion in C9ORF72 is a major cause of both FTD and ALS. Copyright © 2011 Elsevier Inc. All rights reserved. The chromosome 9p21 amyotrophic lateral sclerosis-frontotemporal dementia (ALS-FTD) locus contains one of the last major unidentified autosomal-dominant genes underlying these common neurodegenerative diseases. We have previously shown that a founder haplotype, covering the MOBKL2b, IFNK, and C9ORF72 genes, is present in the majority of cases linked to this region. Here we show that there is a large hexanucleotide (GGGGCC) repeat expansion in the first intron of C9ORF72 on the affected haplotype. This repeat expansion segregates perfectly with disease in the Finnish population, underlying 46.0% of familial ALS and 21.1% of sporadic ALS in that population. Taken together with the D90A SOD1 mutation, 87% of familial ALS in Finland is now explained by a simple monogenic cause. The repeat expansion is also present in one-third of familial ALS cases of outbred European descent, making it the most common genetic cause of these fatal neurodegenerative diseases identified to date. Copyright © 2011 Elsevier Inc. All rights reserved. Copyright statement: Copyright ©2012 Verbeeck et al. ; licensee BioMed Central Ltd.
FUS immunogold labeling TEM analysis of the neuronal cytoplasmic inclusions of neuronal intermediate filament inclusion disease: a frontotemporal lobar degeneration with FUS proteinopathy. Stepwise acquirement of hallmark neuropathology in FUS-ALS iPSC models depends on mutation type and neuronal aging.